Watson Martin courses and qualifications provide great value for money. Our CIPD prices include a choice of workshops or online learning, a dedicated expert tutor for every candidate, flexible start dates AND interest free payment plans for self-funders. PLUS – Register for one of our CIPD programmes and save money on thousands of goods and services when you apply for an NUS Extra card! 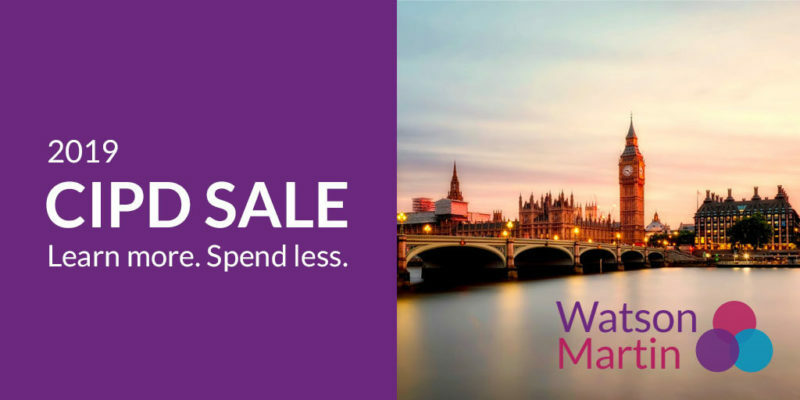 Hurry the clock is ticking – our super sale ends on 25 January! Click here to request your CIPD brochure now. Or call our advisers on 020 7932 2760 for further information about Watson Martin CIPD qualifications, Apprenticeships or in-company courses. *Discounts exclude CIPD fast track programmes and awards. Here are just some of the 251 reviews we have received this year giving us a 4.5 star rating on the independent review site Coursecheck.